Stephen Kotlowski in front of his ever present Ultra Tec, giving his "thumbs up" frequently seen in photos. 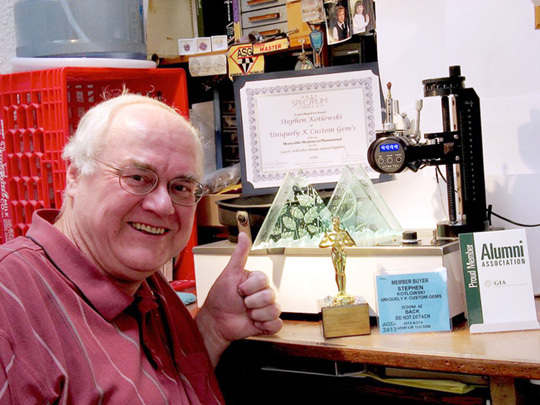 Note some of his awards displayed. 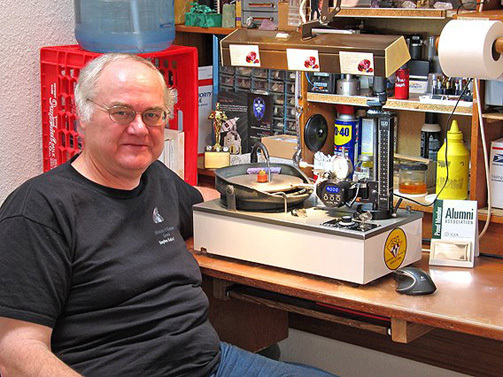 Stephen Kotlowski, a Supreme Master Gem Cutter and Facetor of our finest colored gemstones, passed away unexpectedly in Sedona, in October of 2015, where he had been living for the past five years. 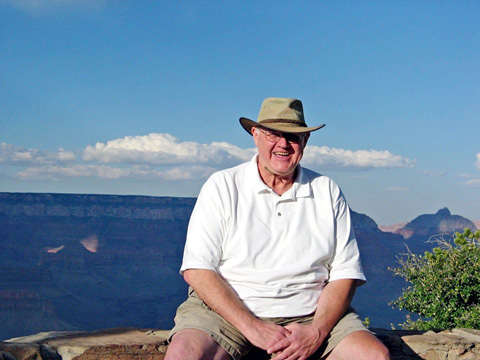 His giving nature and willingness to share his decades of knowledge and experience with others who had interest or the need, will certainly be missed. 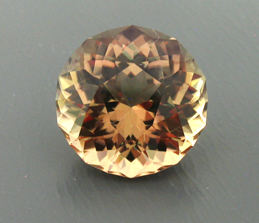 The owner of All That Glitters had met him for the first time over 20 years ago (as both had been contacted by the first person to introduce Color Changing Turkish Diaspore to the trade), and worked closely with him over the past 12 years for recutting and cutting the finest color that was in the All That Glitters inventory. 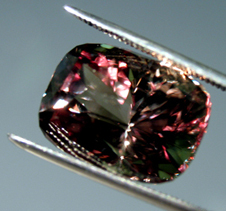 Though All That Glitters had used many fine cutters in the past, including other award winners, Stephen was special in many ways and our very fine rough went to Stephen after 2003. 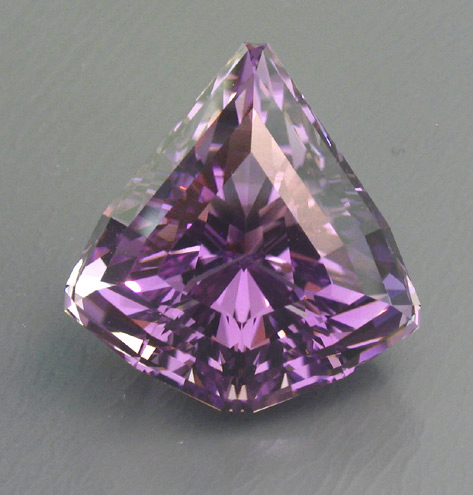 Stephen was extremely meticulous and patient when cutting difficult gemstones such as Diaspore and Kunzite. 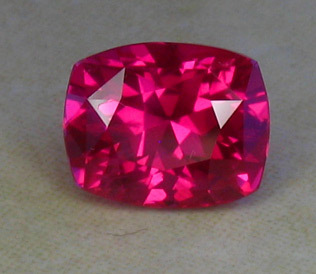 No one could re-cut a gemstone with such a minimal loss as Stephen; he frequently created new cuts that were determined by the rough and didn't work off of design diagrams. 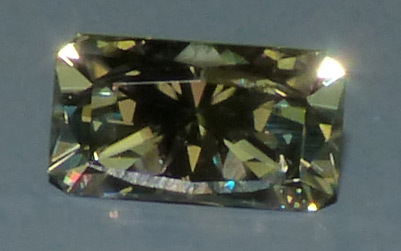 For these on-the-fly custom designs, he would use "UK" (Uniquely K - for Uniquely Kotlowski) along with the general description of the shape to describe his new cut. He won numerous awards in the AGTA Cutting Competition (as well as others) in the past. 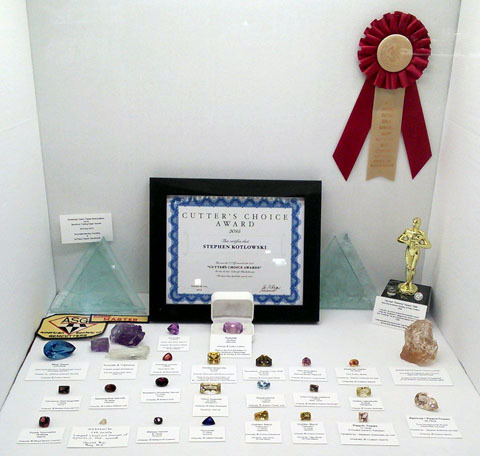 The gemstone community has lost not only a master in cutting, but a gentle kind person who had many interests he shared with others, was done to earth and freely gave his knowledge/help. 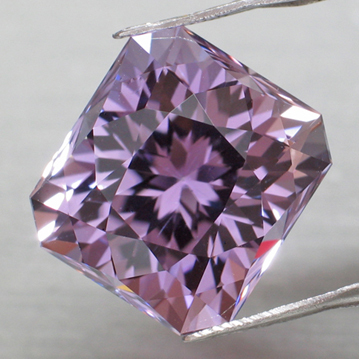 This page is dedicated to his work that we currently have in inventory or have recently sold. 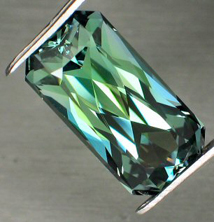 All gemstones below were faceted by Stephen Kotlowski (or re-faceted) from All That Glitters rough or gemstones that we both felt would be enhanced and benefit by proper cutting/angles/polish. 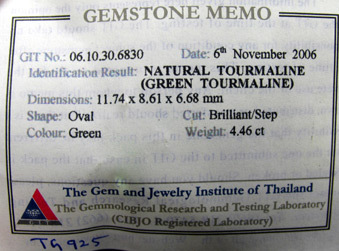 They are listed alphabetically by gemstone species. Photos of Stephen are scattered throughout. 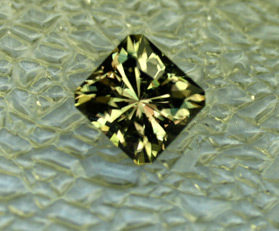 55.88ct Synthetic Alexandrite - Could be the largest ever faceted! 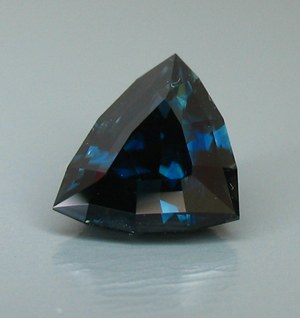 This large Synthetic Alexandrite is from our Laser Rod material, and was faceted by our Award Winning Supreme Master Gemcutter - Stephen Kotlowski. 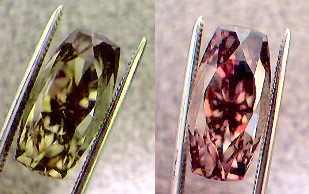 We have many pictures showing the progression from the rough to the finished gem seen above. 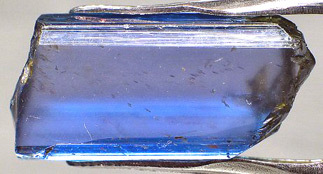 It measures 25.25x20.12x16.08mm. 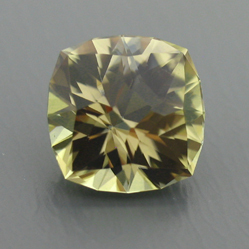 The polish is incredible as our cutter used 200k diamond powder in the final polishing step. 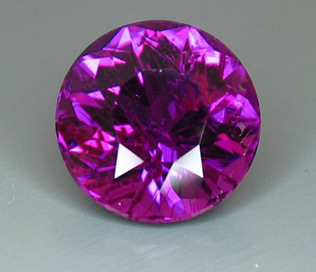 Depending on the lights, the body color is pinkish red, amethyst purple and under a 65k Lumichrome Full Spectrum light, the color can be a greenish, bluish or teal. 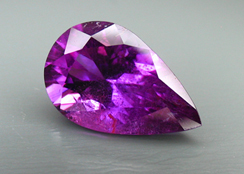 Normal lighting conditions show a more purplish body color with teal or blue highlights dancing around the internal facets! 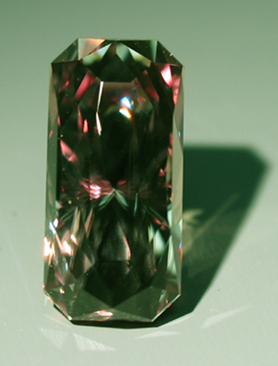 We haven't been able to obtain accurate color photos of Alexandrite or Ruby at times, possibly due to the Chromium. 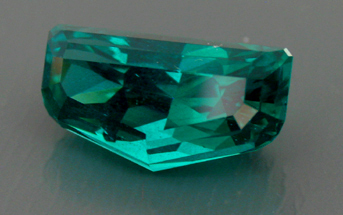 The gem may have a body color of teal to our eyes, but the camera sees it as a very different color,. Even when the office fluorescents show a purple color, cameras are seeing bright pinkish red! 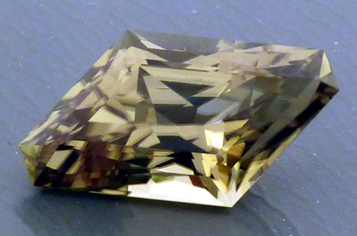 This was custom faceted for one of our customers. It is up for sale using All That Glitters as a broker, as our customer has home repairs that require large sums of money. If you have an interest in this this piece, please email us for more details. 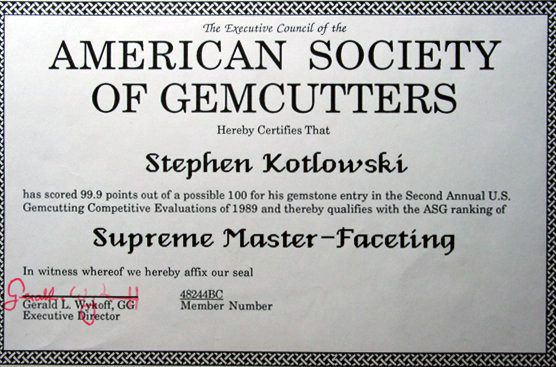 A Cut Above the Rest - Stephen Scores Big (99.9/100) in Competition. His talent is recognized. Diffused Daylight (by a window, under a tree, etc. ): Shows the best Green under the lighting conditions tested. 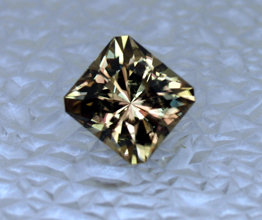 Eye Clean, the finest cutting available, color change varies under different lights - these are the optimum colors ranging from a tan/beige, to a variation of green to a variation of bronze or pink. Call or email for price quotes. 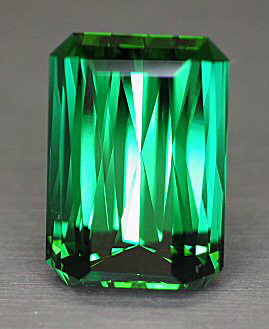 6.20ct Color Change Turkish Diaspore, Brilliant Diamond Cut Emerald, faceted by Master Cutter and AGTA Cutting Competition Award Winner (Stephen Kotlowski. 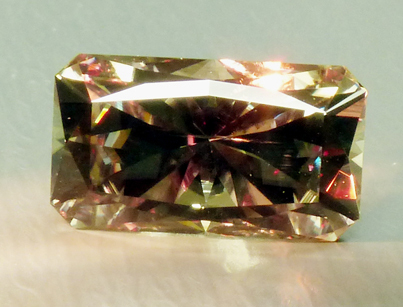 12.13x7.75.8.03mm This beauty appears in two editions of a book on gemstones! Wonderfully cut with a nice color change. 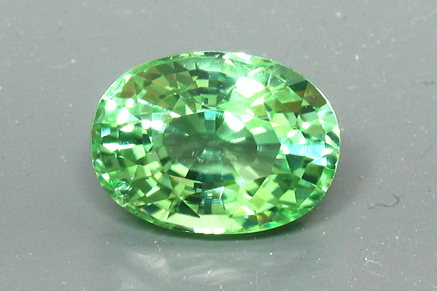 A few inclusions under power, but not visible with the unaided eye. 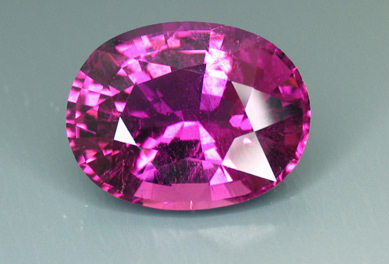 This is to be expected within this rare gemstone. 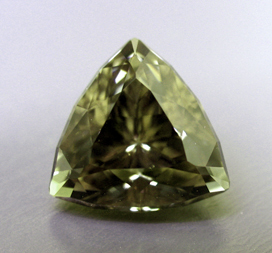 This was faceted by a cutter who has won cutting competions, and in one case, it was for cutting Diaspore. The photos have been color corrected to show what one sees under the appropriate lights. 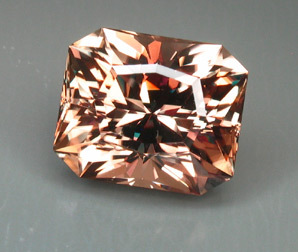 As a rule of thumb, this material behaves in the following manner: Office Fluorescent : Beige with Green over tones Indirect Daylight: Light to Medium Green Incandescent light: Variation of light to medium Pink Mixture of two lights: Body color is green with wonderful peach high lights internally Call or email for price quotes. Stephen in his workshop, new location(?) - Sedona, AZ. 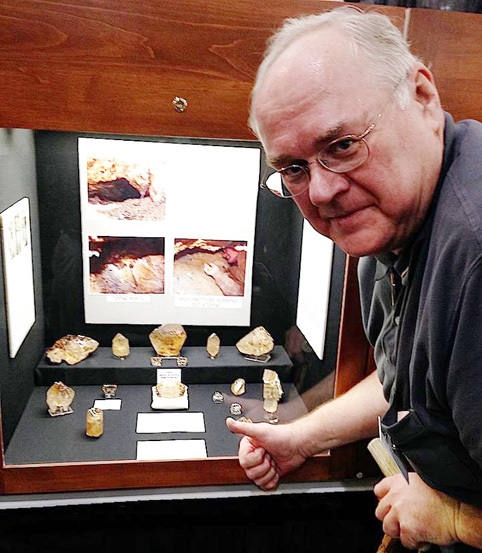 Stephen in front of a case containing what is believed to be Colorado Topaz, found by Richard Fretterd, from the TV show, Prospectors. 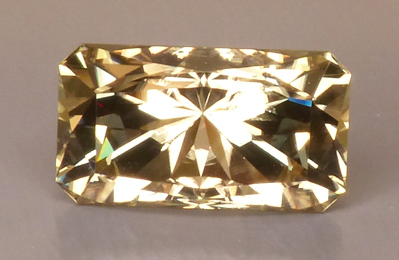 Stephen had been cutting some fine very large Topaz from this particular find for Richard over the past few years. 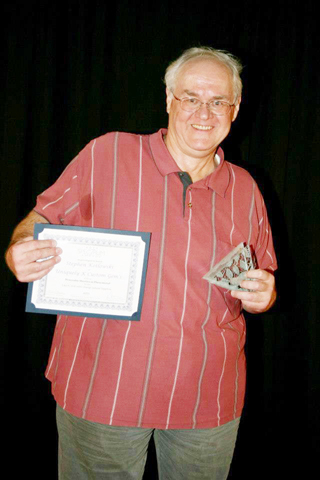 Stephen displaying a recently won award/acknowledgement for his cutting. 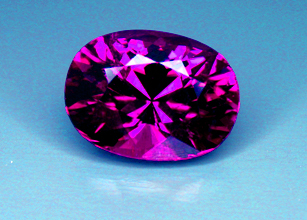 Photographed under 65K Natural Daylight/Full Spectrum Lumichrome light Office fluorescent/incandescent - takes on a more pink color and one could call the color Pink Ice. 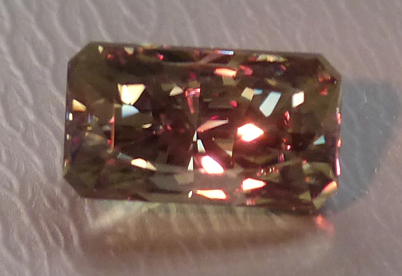 It has incredible sparkle and brilliance! 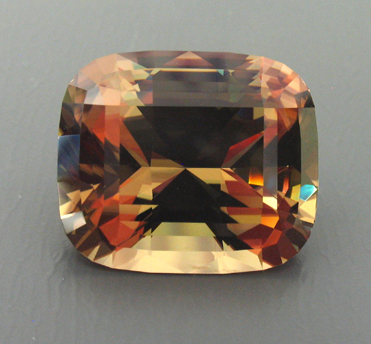 Those in the jewelry trade saw this gemstone for the first time in early December. 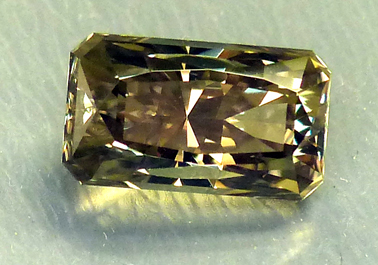 Mr. Brown, owner of All That Glitters was traveling and took one gemstone to show two people he had met previously - a GIA Gemologist and a Custom Goldsmith. 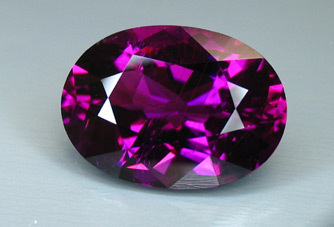 When asked what they thought this gemstone was, the first guess was Amethyst; that was followed by a second guess of Sapphire. These two similar guesses were made by two individuals that were about 100 miles apart and with different backgrounds. 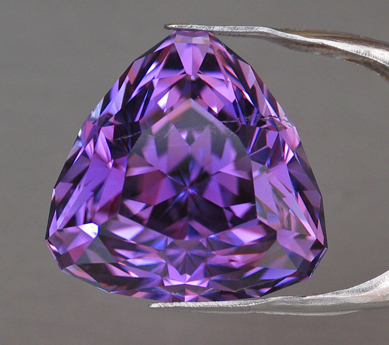 Perhaps the very high polish (200k diamond) made them think this was Sapphire, but the color certainly points to Amethyst initially. 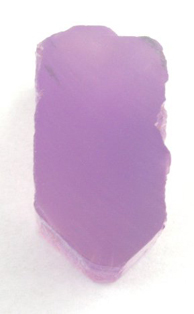 In the above table was a link that showed the step by step faceting of the most saturated gemstone from the large Oceanview Mine Kunzite Crystal. 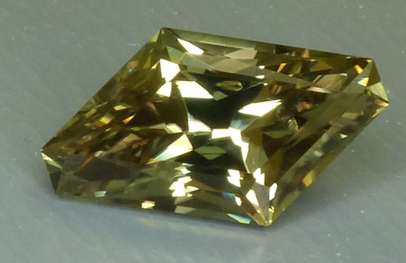 Stephen took pains to document the angles and the indexes of the gems he faceted - and it was necessary since he wasn't working off of faceting diagrams but creating custom designs on the fly. If he had to go back to any facets due to issues, his notebook with the indexes/angles would be required. He usually documented the cutting process with photos, and noted issues encountered, again with photos. 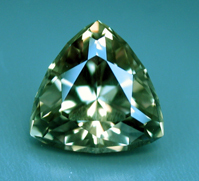 He also frequently took more time to insure that the facets/facet junctions could clearly be seen in the photos. 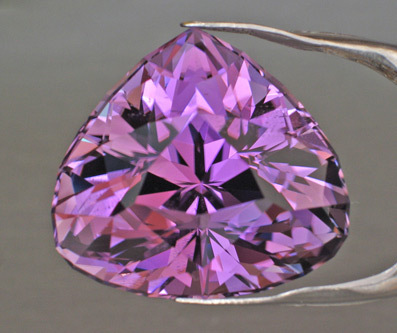 In the case of this Trilliant Kunzite, we both agreed that we would document the cutting. We talked on the phone (and emailed) to insure that the text was appropriate for the photo displayed and chose the best photos to document the process. Changes would be made to photos, text and more, then uploaded on line so that he could view and critique the changes; the process continued until the displayed content was correct. This was all done prior to going live with the page. 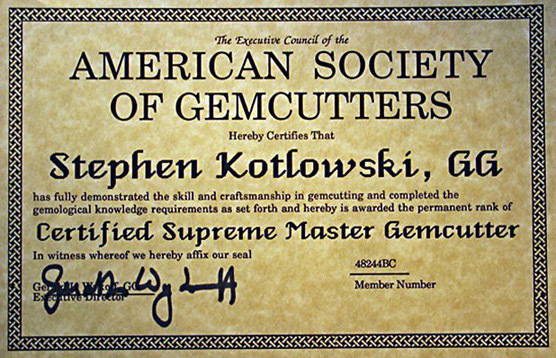 This is great documentation for the cutting of a gemstone by Stephen, and I copied the link and placed it here in hopes that those visiting his page do indeed view it. 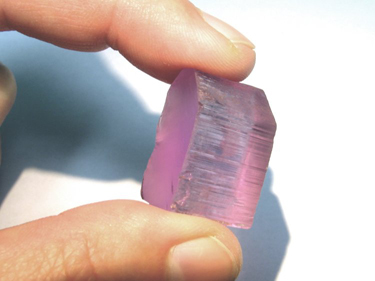 California Kunzite from the Oceanview Mine, the Big Kahuna II Pocket! 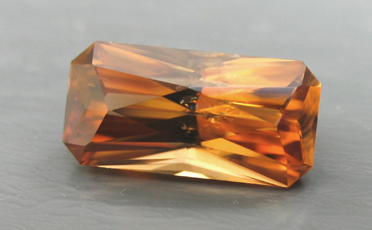 Recent gemstone rough finds in San Diego Co. included the new Spodumenes from the Oceanview Mine. During the 2010 mining of the Oceanview Mine, the 'Big Kahuna' Zone was discovered. This was a large pocket with a series of smaller satellite pockets. 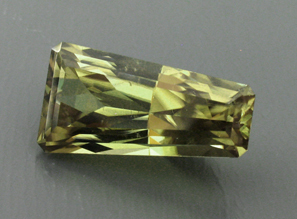 The zone yield Spodumenes, Quartz, Tourmalines and Beryl. 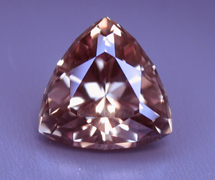 However, on 19 December, they encountered another rich zone: the Big Kahuna II. This zone, on the Baker Boulevard level, may be a down-dip continuation of the Big Kahuna zone that was dug on the next level above (Carter Court level) earlier in 2010. 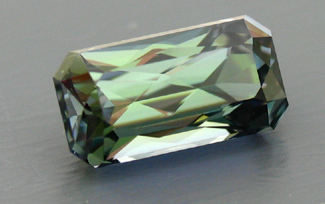 The above rough was faceted by our Master Cutter, so this means every facet meets perfectly and this piece could be entered into the AGTA Cutting Edge Competion. 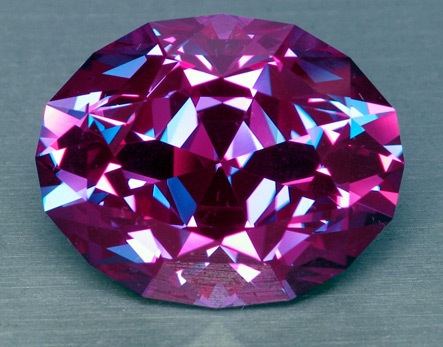 Due to the cutting, polish, color, sparkle and rarity of the material, and the fact that is an American Gemstone, it could possible win in one of the categories! 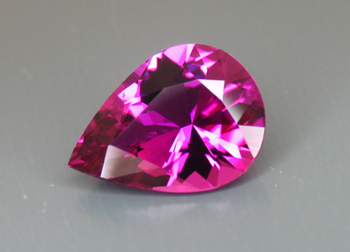 The above price is the wholesale price seen in Tucson 2012 at the GJX Show, International Section, by Brasilians selling a fairly deep pink Kunzite faceted (as well as in the rough). 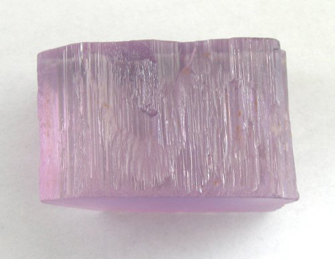 Their material was irradiated - our California Kunzite is natural. 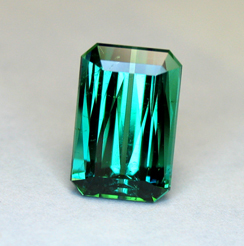 Also, at just under 19cts, ours is much smaller than the 60ct to 100cts or so pieces of the irradiated material that is required to show a decent color. 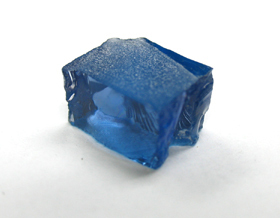 For a larger image, click on the photo above. 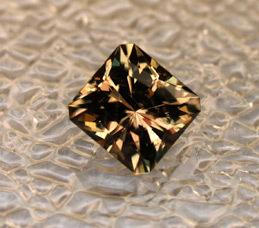 The Oregon Sunstone Rough shown above produced the faceted gemstones you see below. 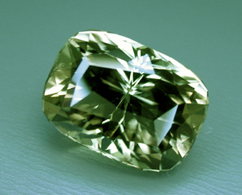 One can get a good idea of some of the waste of the original rough, as one can see the trim marks where a diamond saw blade will remove cracks, inclusions and areas that are not desired in the finished faceted gemstone. 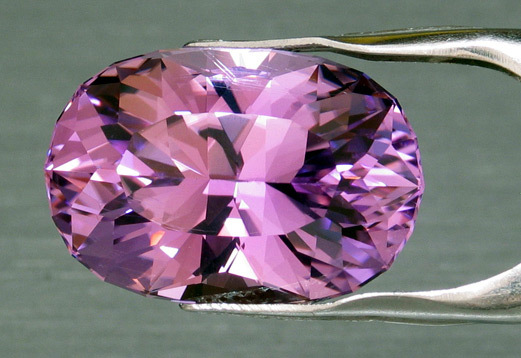 The typical yield that we use when estimating a finished gemstone is 20% - meaning that 80% of the rough that is paid for, is literally trimmed and ground away. 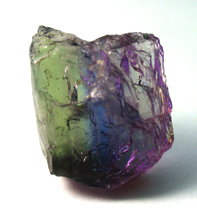 Note that the rough piece on the left produced the gemstone in the photo you see below. You can see some of the glittering schiller in the piece of rough. 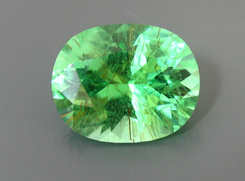 The green outline (watermelon) was removed so as not to mix the green with the reddish orange, as there was a high likelihood that this would muddy the color and the final gemstone would not be the nice pure color you see below! 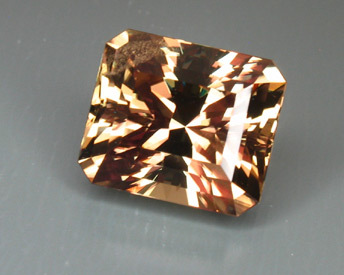 Note - Production this year, 2009, has been quite low due to mechanized mining failures. Problems continue to plague the complicated mechanisms which must all act as one unit. We were only one of two that were allowed to view this rough and make a selection. 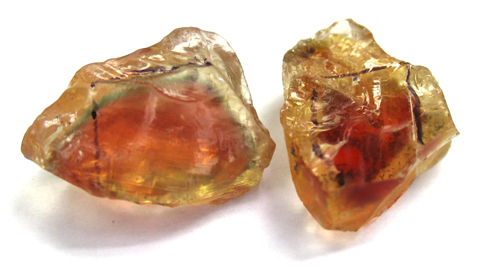 The owner of All That Glitters personally chose these two pieces of rough from this very limited selection. 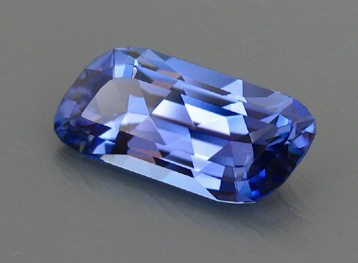 Trimmed Original Piece of Tanzanite Rough The only other piece we know of is in Russia - Wish we had bought it! Stephen just north of where he was living in AZ. A visit to the Grand Canyon. 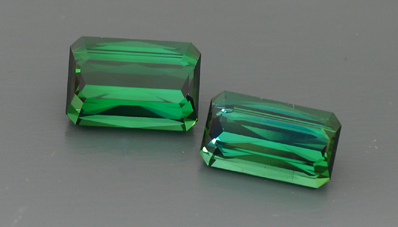 Two Nuristani Tourmalines faceted by our Master Facetor (Stephen Kotlowski), total weight of 11.23cts. 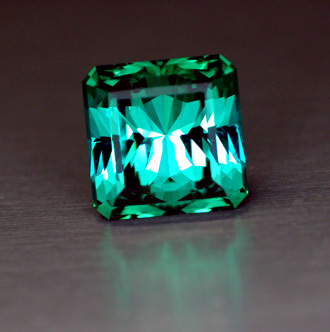 The larger of the two weighs 6.57cts and is more of a beautiful pure green, whereas the smaller one, weighing 4.66cts has hints of blue. 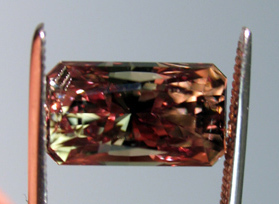 9.31ct Tourmaline - Faceted by Master Cutter and AGTA Cutting Competition Award Winner - Stephen Kotlowski! 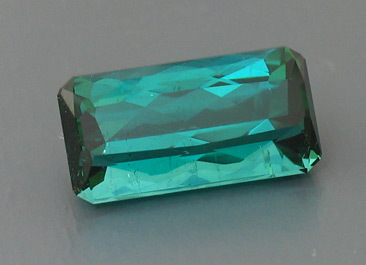 Note - this is the nicest piece of Congo Tourmaline we have seen and a very fine color for Tourmaline. 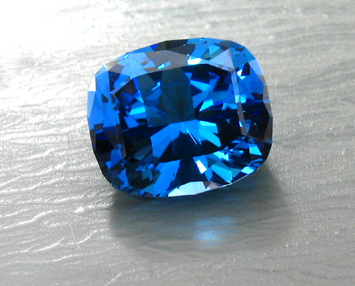 A - 13.00ct Fine Blue with a hint of Green. 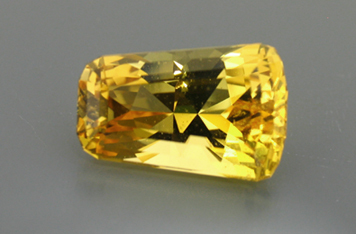 From the famous Golconda Mine in Brasil. 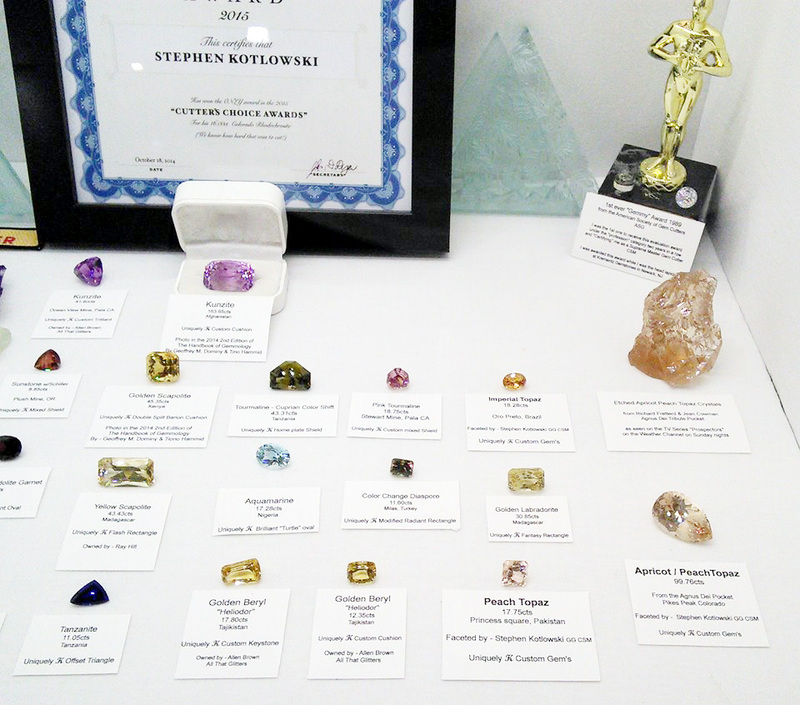 The mine has been closed for many decades and the rough was purchased by All That Glitters over a decade ago and finally faceted by a Master Cutter and AGTA Cutting Competition Award Winner, Stephen Kotlowski. 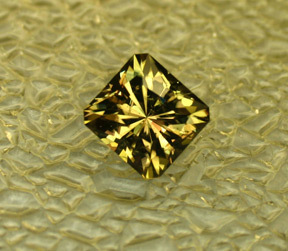 12.10x12.10x9.98mm (atoz-97b-01a) SOLD! 10.28ct Oval Amethyst Purple Tourmaline recut by our Award Winning Master Cutter who is known for his meticulous cutting - Stephen Kotlowski. 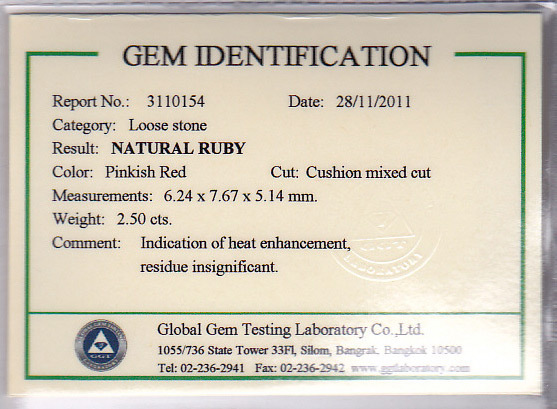 (pntrd-08a-01a) Though now a well known gemstone due to it's publication, we still currently have it at the wholesale cost of a well known West Coast business. Priced back in 2007. Call or email if you have an interest. 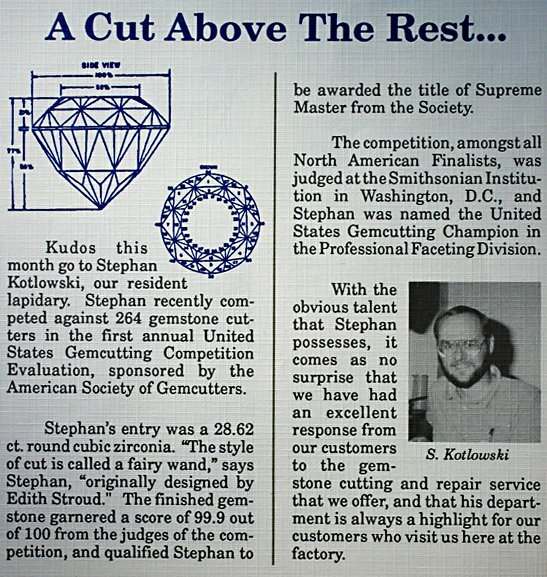 Stephen sold and was a representative for Ultra Tec, a faceting company/machine that he had decades of experience with. 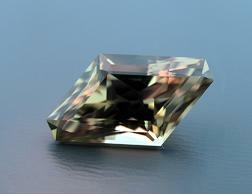 If you knew Stephen, he frequently faceted MANY hours a day and into the early morning hours. 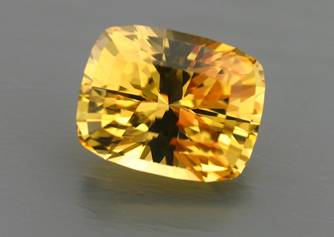 My last conversation with him on October 9, 2015 (Friday), he indicated that he had just finished recutting a very costly large Diaspore (with VERY little loss!) - that was at 6AM and it was early afternoon. He had yet to get any sleep. 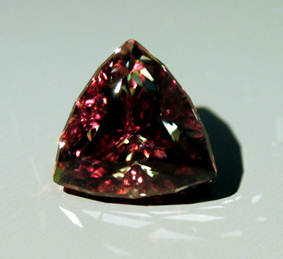 The phrase "Why Not Cut a Gem Today, seems very appropriate when considering Stephen's devotion to cutting. 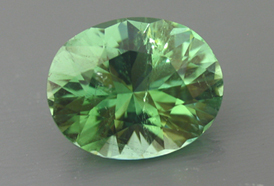 He was very enthusiatic about gemstones, minerals and cutting, and it would please him tremendously to be responsible for someone becoming interested in cutting. 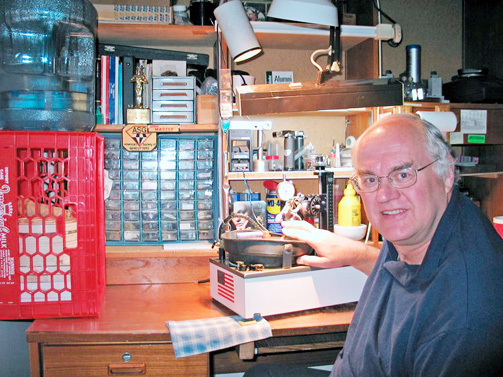 He was responsible for my obtaining an Ultra Tec, teaching me the basics, modifying my machine to work at it's optimum as well as making small additions and tweaking that he had learned (the hard way) during his decades of working with this brand of machine. 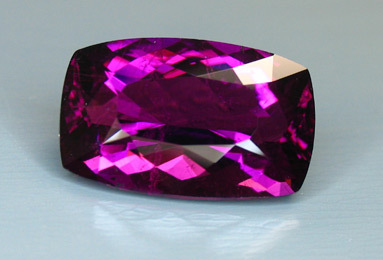 4.00ct Round Mozambique Tourmaline, Royal Purple. 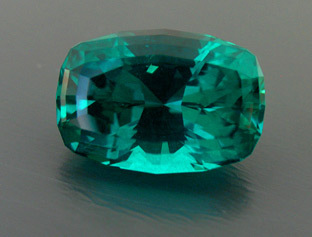 This color is rare as well as the shape. 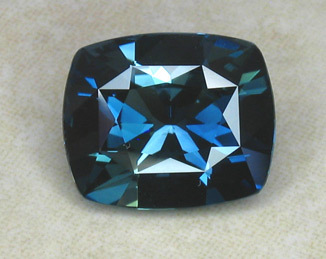 Have not seen ANY rounds of size in this gemstone. 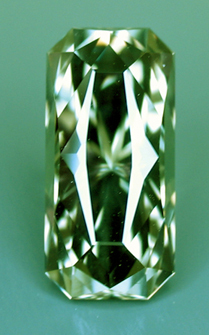 Also, this was re-faceted by our Master Facetor, Stephen Kotlowski, who recently won an award in the ATGA Cutting Competition. 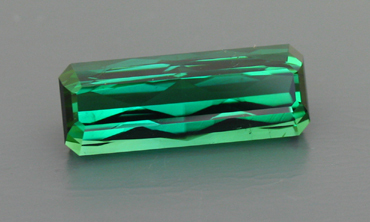 (kaek-06-02) Preliminary tests using a spectrometer do indeed show this to be Cuprian Tourmaline. 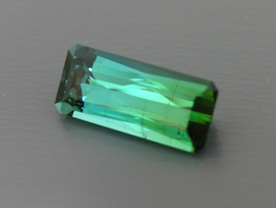 Measures approximately 10.4x6.6mm Photos do not do this gemstone justice - color is richer in person! 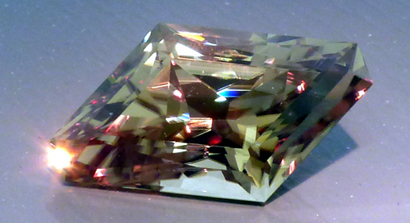 "Mixed" Brilliant Diamond Cut 14.94 x 11.47 x 10.14(d)mm faceted by Master Cutter and AGTA Cutting Competition Winner, Stephen Kotlowski. 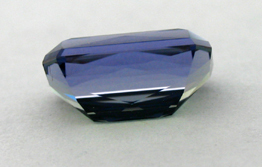 (hv-05-02) This is a very unique piece as it has a color shift. 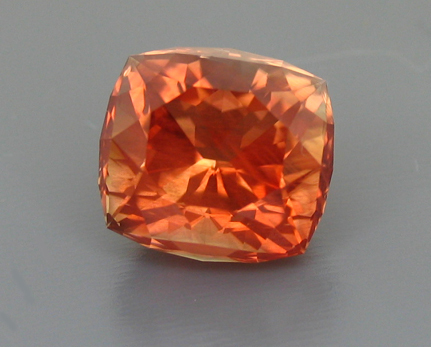 It is very dark under fluorescent lights and looks like a smoky orange. 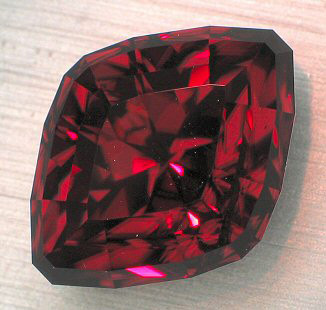 However, under incandescent light, it is a bright red, very similar to ruby or chrome pyrope garnet. 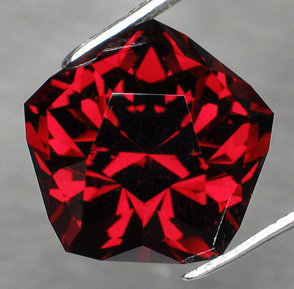 This could contain chromium, which explains the color, but the fact that there is a color change along with the intense red, make this a very unique and unusual piece. 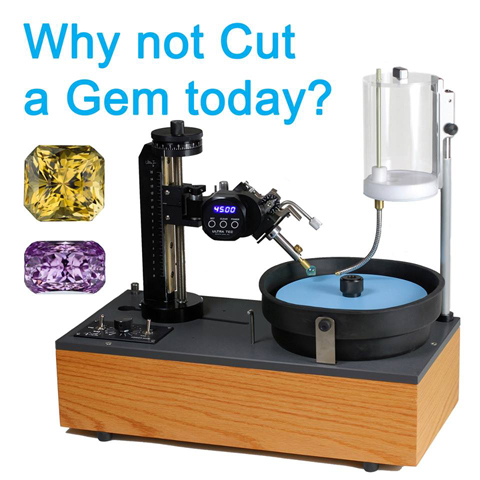 We haven't seen or heard of anything like this previously, nor has our cutter. 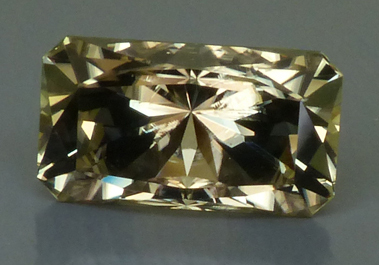 We could not obtain a decent photograph of this gem and had to rely on the photograph that the cutter had taken. 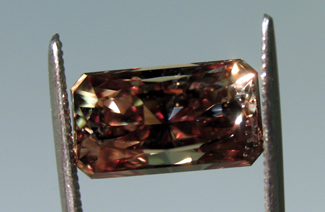 Oh, and another plus for this gem, it is very large for a nice zircon! 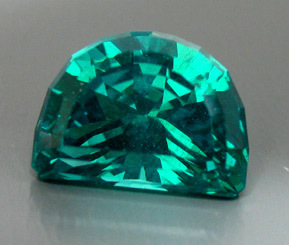 This photo shows the gemstone fully illuminated with lights. In closing, we will end with the photo that we began with. You made many friends both in this country and internationally. Your incredible talent, friendship and experience/knowledge that you freely shared will be greatly missed by many.